How To Allergy-Proof Your Home: get rid of symptoms with our tips! 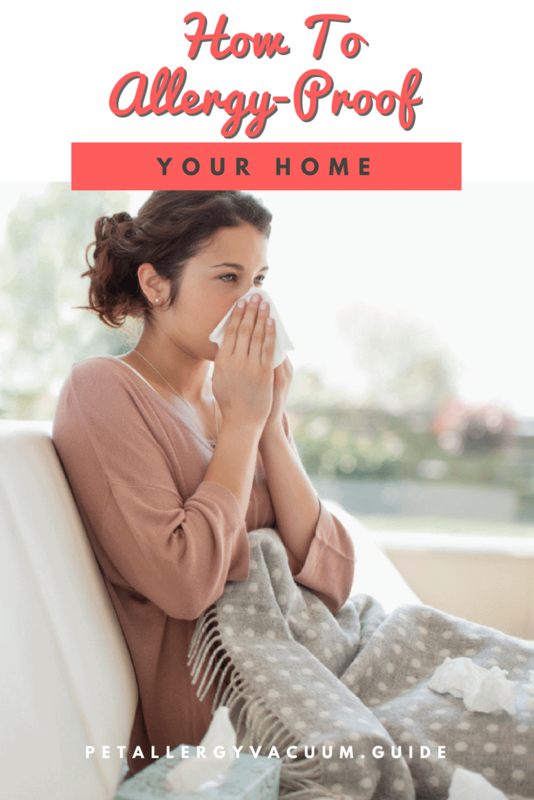 Home / Uncategorized / How To Allergy-Proof Your Home: get rid of symptoms with our tips! As we’ve explained elsewhere on this site, it’s impossible to completely eliminate pet allergens. 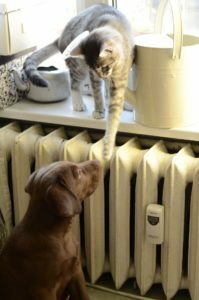 If you have pets and suffer from pet allergies, you’re simply going to have to accept that at least a few allergen particles are going to cross your path. Still, there are a number of things you can do to allergy-proof your home and reduce your exposure to allergens indoors! Have you ever lowered or raised the blinds quickly on a sunny day? That cloud of dust you’ve seen is laden with allergens. Not only dust, but pet dander, pollen, and who knows what else is stuck on your soft furnishings, just waiting to be blown into your face. That’s no good! We suggest replacing soft blinds and curtains with a hard alternative, such as bamboo, composite, or some sort of wood strip. Hard blinds are easy to wipe down and vacuum. You can clean them when you vacuum! Fabric blinds and curtains are dust, dander and pollen magnets, and most of them can’t be laundered or vacuumed thoroughly. Everyone knows pets love rugs. They’re the ideal cozy nesting spots, after all! Sadly, whether your pets sleep on them for hours or simply track dirt back and forth across them all day, rugs are big allergen depositories. Area rugs, knotted circular rugs, and so on are very difficult to clean, so you should consider getting rid of them. Switch to smaller rugs that you can run through the laundry with your linens. These are very inexpensive at places like IKEA, and they still add lots of comfort under a desk, in front of the sink, and so on. You don’t have to worry about them being covered in allergens you can’t remove. Just throw them in the wash each week, and you’re good to go! It goes without saying that carpets are a big commitment. Any room-size flooring changes are time-intensive and cost a chunk of change. But if you own your home and have allergies, it’s a smart investment to replace your carpets with something hard. Carpets are simply impossible to keep completely clean. Think how much dust and allergens are trapped by curtains, and then multiply that by about 100. Even the best vacuums won’t do a complete job, so you’ll need to get a carpet cleaner as well and use it several times per year at minimum. They’re labor-intensive, and they’ll never be as easy to maintain as hard flooring. Allergy sufferers are much better off replacing carpeted floors than struggling to maintain them for a lifetime. It’s a big project, but bamboo is a cheap hardwood alternative that won’t run you too high a price tag. You can steam mop it and vacuum easily. Use some smaller, washable rugs for extra comfort! You’ll still need to clean your floors thoroughly with a capable pet hair vacuum (see our homepage to find recommendations). Still, your job will be much easier, and you’ll actually be able to be successful in removing allergens. We’ve already talked about how curtains, blinds, rugs and carpets are allergen traps. The same is true of any soft furnishings. So, whenever you can avoid them, do so! Use a futon rather than a sofa, since the covers are much easier to wash and there are fewer nooks and crannies. If that’s not possible, find a good cover for your sofa that can be laundered each week. Do the same with any throw pillows you have around the house. Using zippered covers is a great way to reduce allergens. You can wash them weekly as part of your cleaning routine. You can make practical choices like this whenever you shop for a new piece of furniture. If you’re after a new chair for sitting and reading, look at rockers rather than plush armchairs. Use washable cushions on dining room chairs rather than chairs with upholstered seats. You should pay particular attention to soft furnishings frequented by animals! Avoid carpeted pet furniture for cats, opting for cardboard that you can cycle through regularly. If you have a dog bed, (and you should, if you want to keep furry friends from depositing allergens on your bed or couch), make sure it has a washable cover as well. Weather permitting, brush your animals outside or on the porch. Somewhere you can easily sweep fur away from the house is ideal. Obviously, you don’t want to brush your dog outside when it’s 20 below. The point is to take advantage of opportunities to leave allergens outside your home! The best thing you can do is to contain allergens by catching them before they spread around the house. Regular baths are ideal, and brushing as often as possible never hurts. You may find that your pooch actually likes being vacuumed (we’ve done that with a few labs, and they love it!). In that case, just turn the suction low and use an upholstery attachment to clean loose allergens and hairs from their coat. Shoes are incredibly unsanitary to wear indoors, and they’re also no good when you have any kind of allergies. You’ll track in outdoor allergens and germs, plus lots of filth. Every piece of dust and dirt will just give allergenic proteins a place to land, so use a landing or a mudroom to give yourself a buffer zone between your clean living space and the outside world. If you or a family member has severe allergies, it’s a good idea to make their bedroom a pet-free zone. This is easier with dogs than cats, since cats can get very insistent and disruptive when they can’t explore everywhere. The point is to give the person with allergies as clean and healthy a living space as possible.